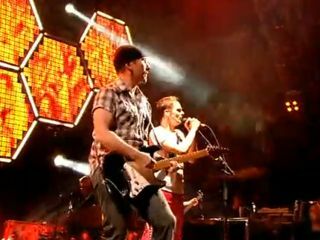 When U2's The Edge joined Muse last night (26 June) at Glastonbury for a rousing rendition of Where The Streets Have No Name, you'd swear that the Irish superstars had made it to the Pyramid Stage after all. Bono's recent back operation forced U2 to cancel their scheduled Friday night (25 June) headline appearance and to postpone the start of the second leg of their 360 Tour. But the combination of The Edge's instantly recognizable, echo-laden guitar sound and Muse frontman Matthew Bellamy's quasi-operatic vocal howl was an uncanny mixture, one which the crowd greeted rapturously. "This is our friend, The Edge!" Bellamy shouted to the crowd at the song's conclusion. The U2 guitarist gave Bellamy a quick embrace, raised his fist victoriously and then walked briskly off stage, a wide smile on his face. Last night marked the second time Muse topped the Pyramid Stage bill in six years. Their 18-song set drew heavily on their most recent album, The Resistance.